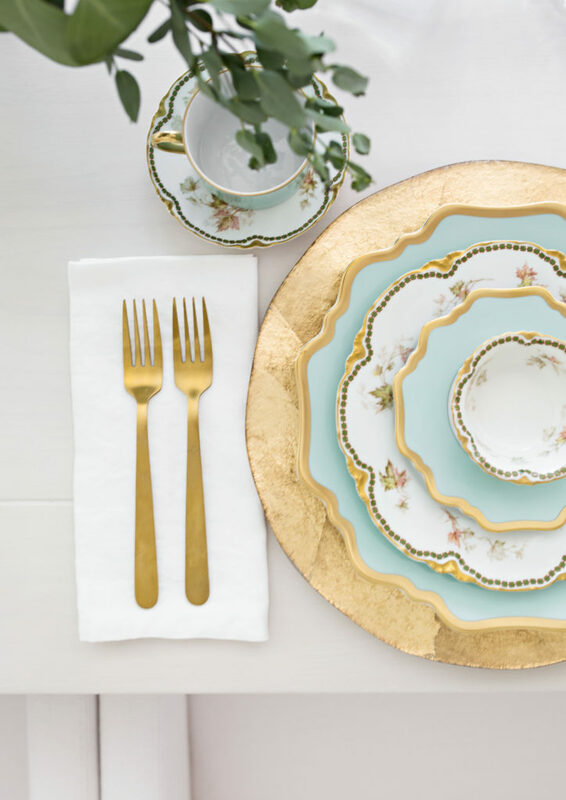 When I was 25 years old, my grandmother gifted me her set of vintage Limoges china, given to her by her mother. I really had no appreciation at the time for this heirloom – I figured it would be something I would give to my own children someday, but wasn’t sure if I’d ever use it. Recently, I unpacked it and instantly the memories came flooding back to me. 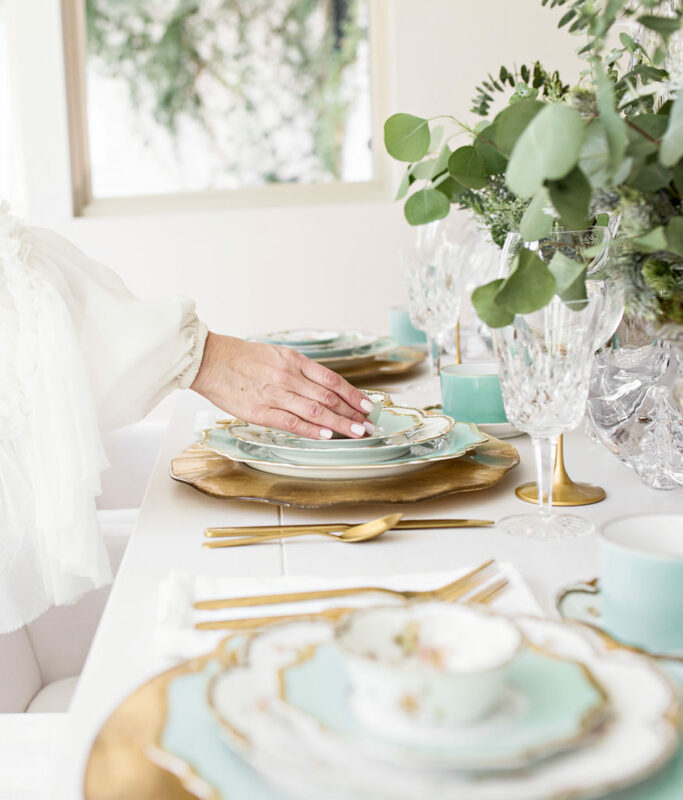 I remembered how pretty it was – delicate and dainty, with aqua and gold intertwined in an intricate pattern with a scalloped edge. Yet, it still seemed so . . . old. This is why I was inspired to modernize it and make it current enough for a present-day Christmas table. 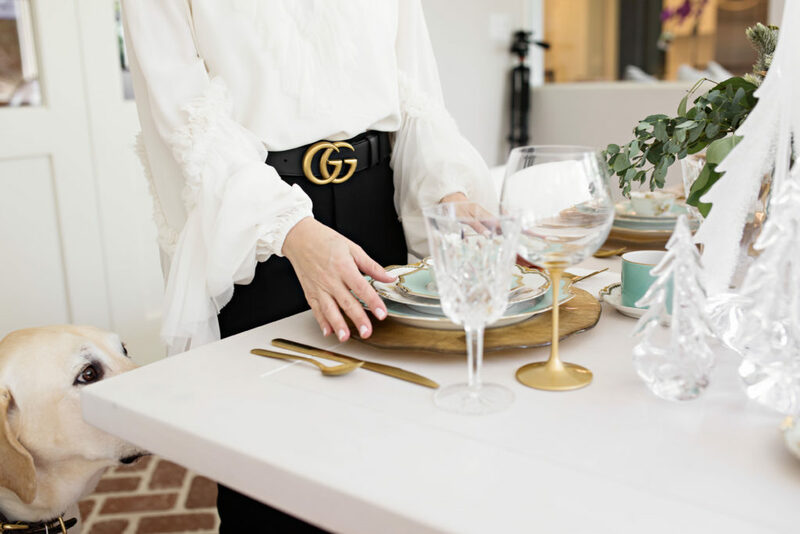 I knew I needed to add some contemporary elements to the decor to achieve this – something that would make this table chic. Enter Simon Pearce. 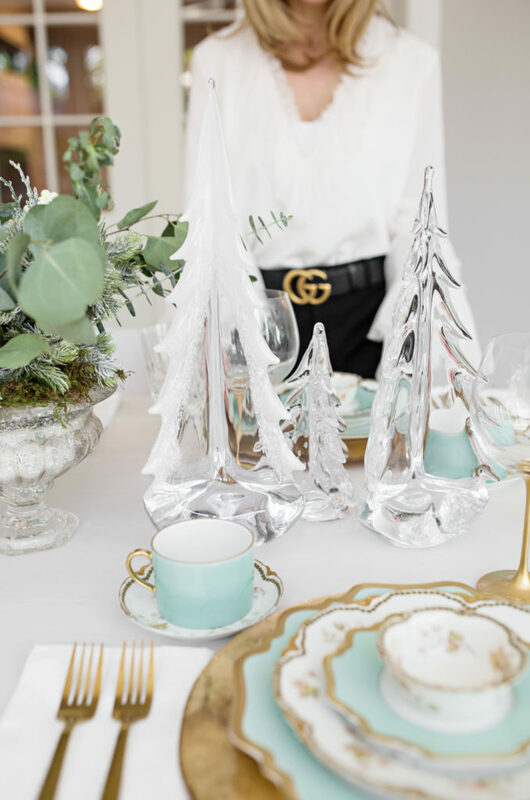 Known for their exquisite, hand-blown glass, the crisp, bold lines of their Vermont-inspired evergreen trees gave my table a fresh edge. By using a variety of sizes with different finishes, I was able to bring out the beauty and tranquility of an enchanted winter forest. 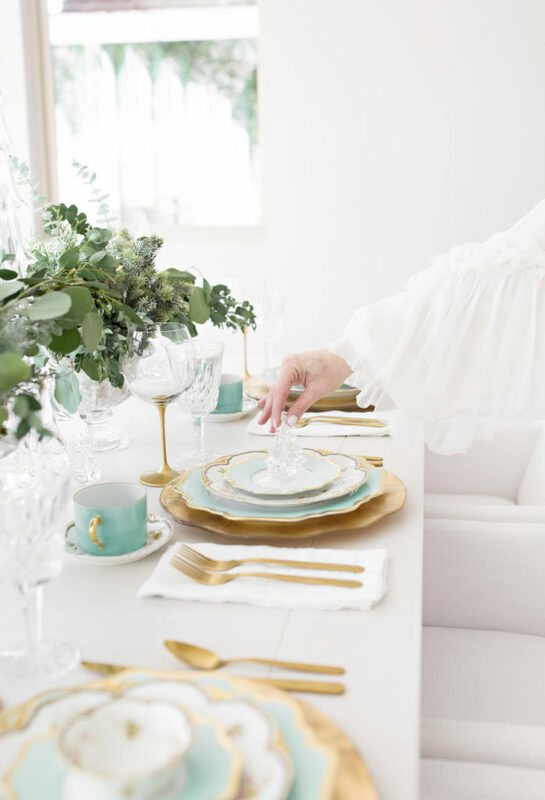 I also used dinner plates from one of my favorite dinnerware designers, Anna Weatherley, to compliment and layer the striking place setting. 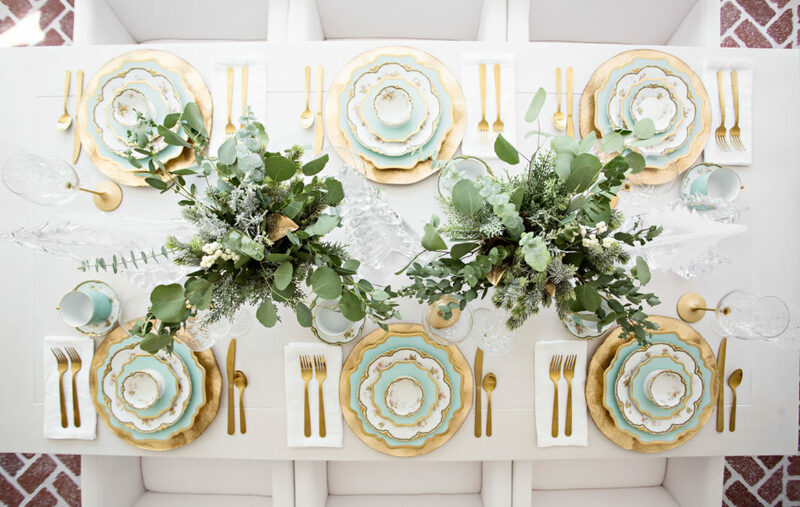 Vintage, new, glass, porcelain, gold, greenery – this table has it all! Heirloom crystal and store bought glasses are placed side-by-side here. 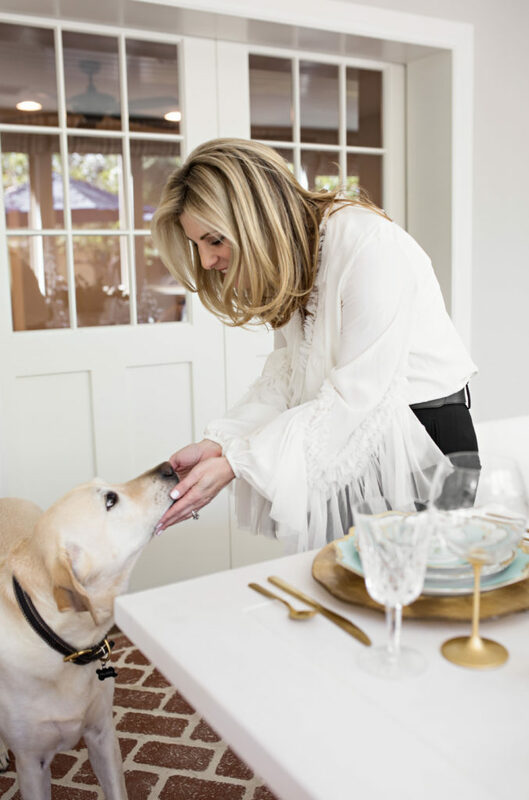 Waterford meets Target – really! I do it all the time. The beauty of this table is that I’ve used what I already had, what I’ve borrowed and what I’ve purchased. It’s okay to mix all of these together! You just can’t appreciate the beauty in these hand-blown glass trees until you’ve seen them in person. They are stunning! A friend of mine introduced me to Simon Pearce – it’s such an interesting story. Simon Pearce started his early creative life as a potter, working for his family on the southeastern coast of Ireland. He then trained as a glassblower in Italy, and Orrefors in Sweden before moving to America in 1981, settling in Vermont, to create Simon Pearce Glass. Famous for its range of styles, pure materials, and luminosity and inspired by centuries-old Georgian glassmaking techniques, Simon set out to create designs that bring pleasure and can be used everyday. 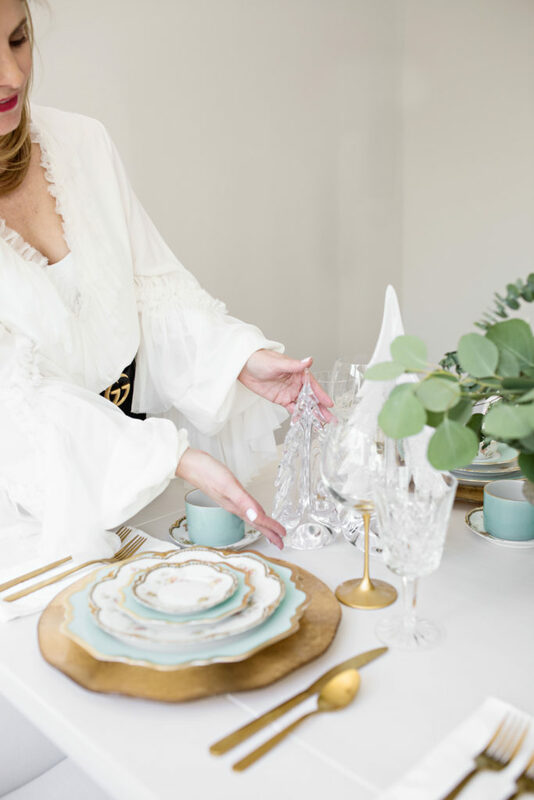 Their pottery is hand-thrown and their lead-free crystal glassware is made with custom molds – each handcrafted piece carries a story that lends meaning, authenticity, and grace to every use. These trees are definitely an heirloom – what a treasure to enjoy in your home and then be able to pass these down to your children, and then their children. These will stay in the family forever. All of the trees are so unique, and because they are each crafted by skilled artisan glassmakers, no two are alike! 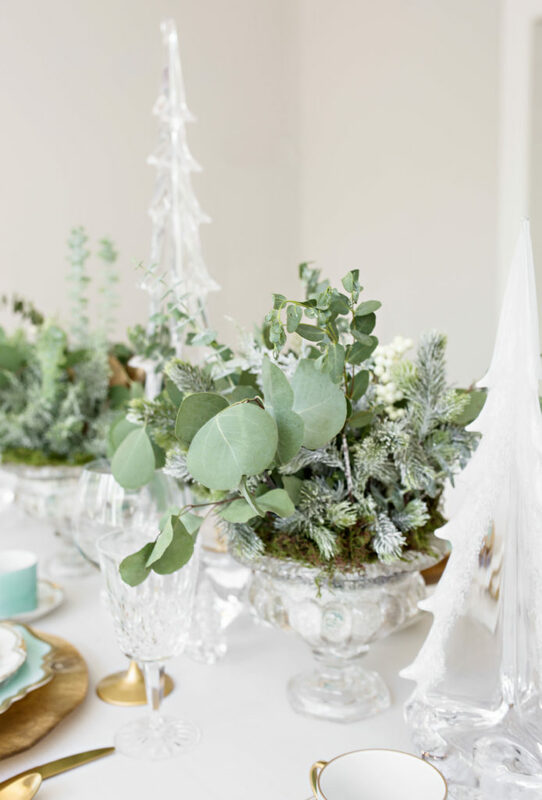 These faux evergreen plants with silver mercury planters from Pottery Barn can be used all winter long. I added some real eucalyptus leaves and greenery to them for added fullness. 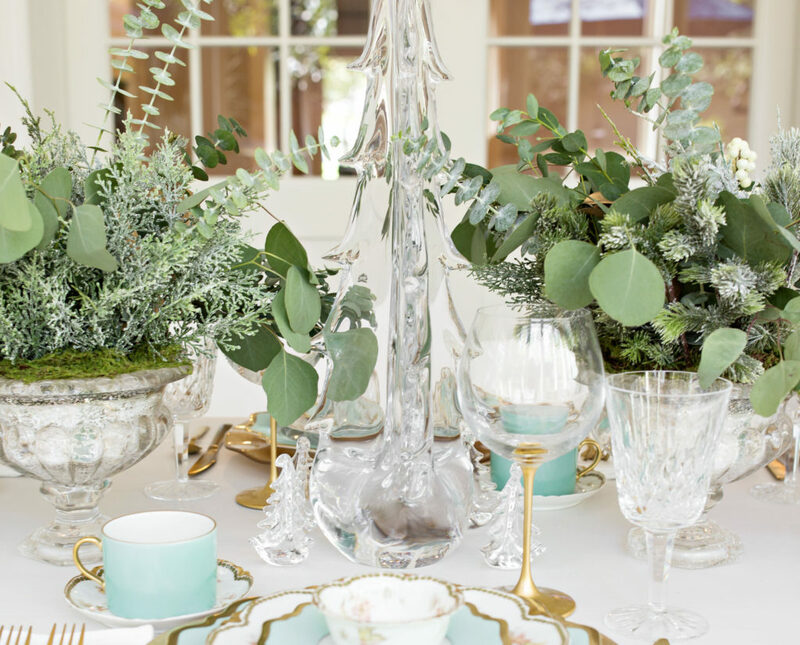 White and green are such an ethereal color combo this time of year! Of course, Palmer had to be in the shot – we always oblige!